What is the Durand Line? How is the border between Afghanistan and Pakistan a troubled legacy of colonialism? Use our reference resource to learn more. 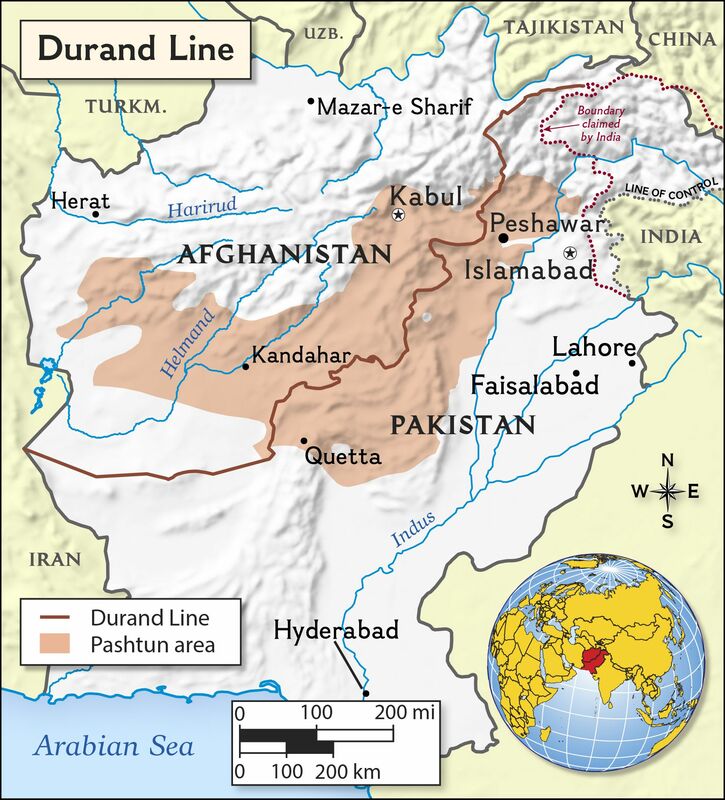 The Durand Line serves as the border between Pakistan and Afghanistan. The line, established in 1893 and has been disputed ever since. Critics of the new fence along the Afghanistan-Pakistan border think it will “divide families and friends along the Pashtun tribal belt straddling the colonial-era Durand Line.” Who are the Pashtuns? Read through our short article for some help. Pashtuns are an ethnic group indigenous to Afghanistan and Pakistan, inhabiting a trans-border region called “Pashtunistan.” Although most Pashtuns live in Afghanistan and Pakistan, they also have significant communities in the United Arab Emirates, the United States, Iran, and the United Kingdom. The nearly 50 million Pashtuns around the globe are considered the world’s largest tribal group. Pashtuns are considered a tribal group because their political structure is based on the family or clan. There are about 350 major Pashtun clans. Pashtuns are sometimes known as Pashtos or Pathans. Nobel Peace Prize winner Malala Yousafzai (from Pakistan), former Afghan President Hamid Karzai (from Afghanistan), and Bollywood superstar Salman Khan (from India) all have Pashtun ancestry. What is the Durand Line? Read our student-friendly article for some help. The Durand Line defines the border between Afghanistan and Pakistan. The agreement establishing the line was signed in 1893 by Mortimer Durand, the foreign secretary of the British Indian government, and Abdur Rahman Khan, the emir of Afghanistan. Wait a minute—why was a British delegate for India negotiating a treaty on behalf of Pakistan? At the time, Pakistan was still a part of India. India, in turn, was controlled by the United Kingdom. The United Kingdom ruled India from 1858 until Indian and Pakistani independence in 1947. Why have Pashtuns traditionally opposed the Durand Line? Pashtunistan straddles the Durand Line, which largely follows rivers and other physical features—not ethnic boundaries. As a result, the border split a single community into two separate countries. “People on both sides of the Durand line consider it a soft border,” said former Pakistani Ambassador to the U.S. Husain Haqqani. FYI: Balochis, a smaller ethnic group, were also split by the Durand Line and also support the idea of their own independent state or autonomous region—Balochistan. Is the Durand Line between Afghanistan and Pakistan a stable, peaceful border? No. It’s one of the most dangerous and contested borders in the world. The border itself is a dangerous place. This year, there have been two major skirmishes. In February, Pakistan launched missiles into the Afghani provinces of Nangarhar and Kunar, in retaliation for a terrorist bombing Pakistan associated with Afghan militants. (The Islamic State officially took responsibility.) Thousands of Afghanis were allegedly left homeless. In May, Afghan military forces attacked a Pakistani census team collecting population data in Chaman, Pakistan. Afghan leaders claimed the team crossed the border into Afghanistan. Between two and nine civilians were killed, and dozens more wounded. The Reuters article quotes a Pakistani army officer as saying the proposed Durand Line fence is “an epoch shift in border control management.” How so? Pakistan has never guarded and patrolled its border with such intensity: “There will not be an inch of international border (in South Waziristan) which shall not remain under our observation,” said the officer. The Pakistani military is expected to recruit tens of thousands of new troops to patrol the border. The border would be marked by a 3-meter (9-foot) wire fence topped with barbed wire. Why is Pakistan pursuing stronger border control policies? Pakistan claims the increased border security will prevent terrorist attacks in both countries. According to ABC News, the border region was a longtime stronghold for both al-Qaida and the Taliban, as well as enormous organized crime syndicates. Why does Afghanistan oppose building the fence and increased border security? Afghanistan does not recognize the legitimacy of the border at all, so strengthening it with fences and guard towers can be interpreted as antagonistic. Afghanistan does not acknowledge the Durand Line as an official border because many think Pakistani Pashtuns were excluded from the 1893 agreement. (The Durand Line was established after the British conquered the Pashtuns who had previously controlled the border area.) Pashtuns are seeking a united territory. The United States has been a military presence in both Afghanistan and Pakistan for decades, with bases throughout both countries. Here, U.S. Army Sgt. 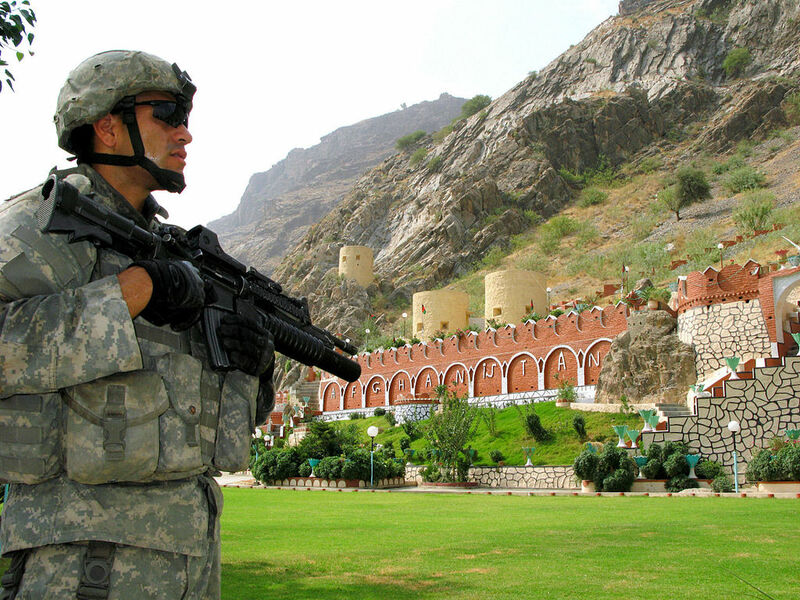 Michael Espejo patrols the border at Torkham Gate, Afghanistan, during the Afghan Independence Day ceremonies in August 2007.